As the economy continues to struggle, fundamental attitudes toward business are little changed. 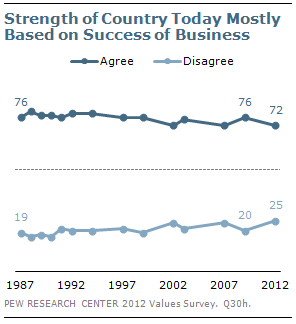 Americans continue to see the success of business as central to the strength of the country. At the same time, large majorities continue to say that business corporations make too much profit and fail to strike a fair balance between making profits and serving the public interest. As recent surveys have shown, the public also is of two minds about government regulation of business. Most Americans agree that free markets need government regulation to protect the public interest. However, nearly as many say that government regulation of business usually causes more harm than good. Positive opinions about Wall Street have edged lower since 2009. 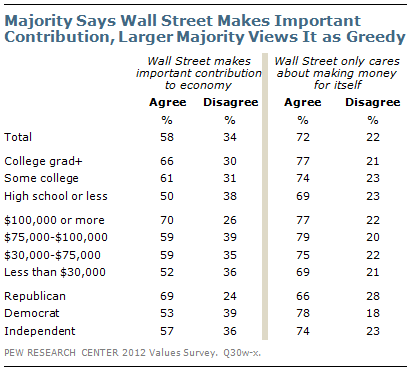 A majority continues to say that Wall Street makes an important contribution to the economy. But most Americans think that Wall Street only cares about making money for itself. Views of labor unions, which reached all-time lows in the previous political values survey in 2009, have remained stable since then. 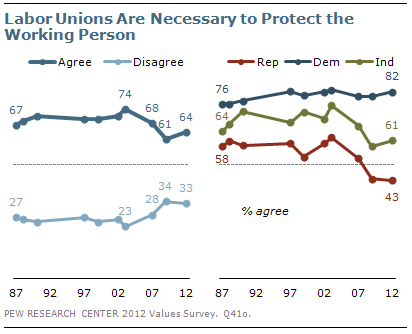 Nonetheless, fewer say labor unions are necessary to protect working people than did so a decade ago. Fully 72% of Americans agree that “the strength of this country today is based on the success of American business.” This opinion has endured, largely unchanged, for the past quarter century. Moreover, it is a value on which there are only modest partisan differences: 77% of Republicans believe the country’s strength is tied to the success of business, as do 71% of both independents and Democrats. These opinions have proven resilient over the past 25 years, as has the belief that the country’s strength is tied to the success of business. Criticisms of business have long been divided along partisan lines. In the current survey, 52% of Republicans say business strikes the right balance between profits and the public interest, compared with 37% of independents and just 29% of Democrats. Partisan differences on this measure, while little changed from 2009, are far greater than they were in 2007, the final year of George Bush’s presidency. Fully 76% of Republicans say that government regulation of business does more harm than good, among the highest percentages ever. Just 41% of Democrats agree, one of the lowest percentages ever. In 2007, identical proportions of Republicans and Democrats said government regulation of business did more harm than good (57% each). The public’s skeptical view of the impact of government regulation of business is balanced by the widespread view that government regulation is needed in a free market economy. Overall, 63% agree that “a free market economy needs government regulation in order to best serve the public interest”; only about half as many (31%) disagree. Beyond the wide partisan differences over each of these measures, both parties are divided over the need for – or the impact of – government regulation. 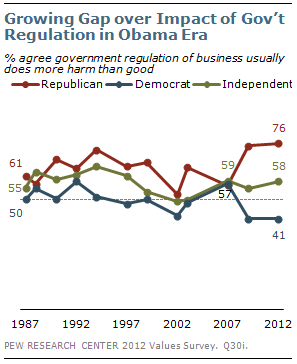 Nearly nine-in-ten Tea Party Republicans (87%) say that government regulation of business does more harm than good. A smaller majority of Republicans who do not agree with the Tea Party, or have no opinion of the movement, agree (65%). But the larger division among Republicans is over the necessity of government regulation: 68% of Tea Party Republicans disagree with the idea that a free market economy needs government regulation to protect the public interest. 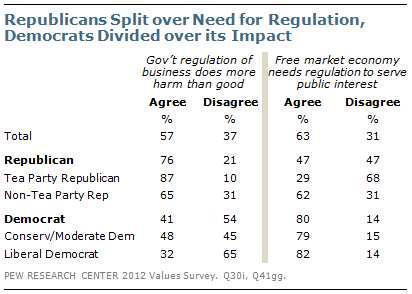 Most non-Tea Party Republicans (62%) say that government regulation of the free market is needed. The Democrats’ internal differences are not as stark, But while conservative and moderate Democrats are divided over whether government regulation of business does more harm than good (48% agree, 45% disagree), most liberal Democrats disagree (65%). Roughly eight-in-ten conservative and moderate Democrats (79%) and liberals (82%) agree that a free market needs government regulation. Positive views of Wall Street have slipped, though only modestly, since the advent of Occupy Wall Street and an increased focus on economic inequality. Currently, 58% agree that “Wall Street makes an important contribution to the American economy,” down from 63% in 2009. A larger majority (72%) agrees that “Wall Street only cares about making money for itself.” Three years ago, 67% expressed this view. Large majorities of college graduates (66%) and those with family incomes of $100,000 or more (70%) say that Wall Street makes an important contribution to the economy. About half of those with a high school education or less and those with incomes of less than $30,000 agree (50%, 52%, respectively). Nearly seven-in-ten Republicans (69%) say that Wall Street contributes significantly to the economy, compared with 57% of independents and 53% of Democrats. Republicans are also less likely than Democrats or independents to say that Wall Street only cares about making money for itself. But sizable majorities across partisan groups – as well as education and income categories – express this view. Overall, 64% agree that labor unions are necessary to protect the working person; 33% disagree. Positive views of labor unions have stabilized, after declining by 13 points from 2003 to 2009. Republicans have grown increasingly skeptical of the need for labor unions. In 2003, 62% of Republicans said labor unions were necessary to protect workers – that figure fell to 53% in 2007 and 44% in 2009. Currently, 43% of Republicans agree that labor unions are necessary, while 54% disagree. The belief that labor unions are needed also fell among independents from 2003 to 2009, from 76% to 58%. Today, 61% of independents say unions are needed to protect the working person. Democrats remain strong supporters of labor unions: 82% agree that they are necessary, little changed from recent years. There has been less change over time in opinions about whether labor unions are too powerful. Currently, 57% agree that “labor unions have too much power.” That is little changed from 2009 (61%), or from the first political values survey in 1987 (59%). Most Americans are concerned that business and government are accessing too much of their personal information. Nearly three-quarters (74%) say they are concerned that business is collecting too much information about people like them. More than six-in-ten (64%) have the same concern about the government. While overall trends on these measures have shown little change since 2007, Republicans are increasingly concerned about the personal information being collected by both government and business. Fully 72% of Republicans say they are concerned about the personal information being collected by government, up from just 39% five years ago. An identical percentage of Republicans (72%) is concerned about business corporations collecting too much personal information, an increase of 14 points since 2007. Opinions among Democrats and independents have shown far less change over this period. 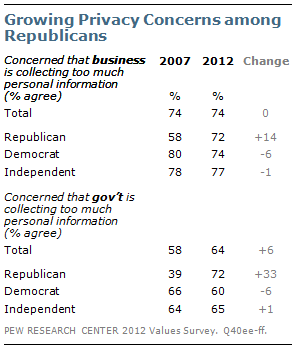 Among both Democrats and independents, higher percentages voice concern about business than about government collecting too much personal information.